Our team of highly experienced hair and makeup artists are here to help you design your dream Bridal look, whether that is timeless and elegant, to classic and natural or relaxed Bohemian beauty, we will create a beautiful look for you and your bridal party. We realise that the thought of having your hair and makeup done can be daunting if it's not something you're used to, but our friendly and relaxed team will help guide you through the process and design a bridal look that you not only love, but that will leave you feeling confident and glowing all day. It's our aim to give our Brides a luxurious styling experience so our kits are stocked with only the best industry brands including MAC, Stila, Nars, Napoleon Perdis, Urban Decay, Element Two, Anastasia Beverly Hills, Model Rock Lashes, Cloud9, White Sands, Nook and GHD (just to name a few!) ensuring a flawless finish perfect for photography that will last well into the evening. Together we have many years of experience behind us, and we love to stay up to date in the latest Hair and Makeup trends to ensure our Brides receive the best service available, and with hundreds of happy Brides recommending us to their family and friends you too will feel confident in your choice of styling team. 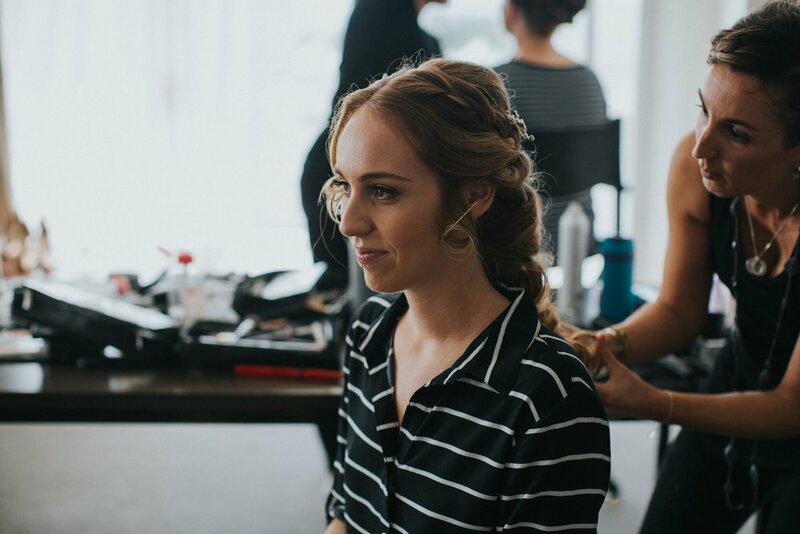 A pre wedding trial is highly recommended and we offer personal one-on-one trial appointments with your styling team at our Sunshine Coast studio. This is where we discuss the style of your wedding and your hair and makeup ideas and trial the look you have chosen. Your trial will be relaxed and fun so bring along your photos or Pinterest board of ideas, and feel free to bring a friend or Bridesmaid along for a second opinion. We work together with you and your photographer to determine a schedule for the day that ensures everyone is ready with plenty of time for photography, and even a glass of bubbles or two. We will arrive on time at your location, allowing you to relax and enjoy the getting ready process without any stress. As part of our Bridal service your styling team are exclusively yours* on your wedding day, meaning our team will not be starting your beauty prep in the wee hours of the morning or rushing off to accommodate another wedding booking, leaving their sole focus and attention on you.